Brooks Koepka has said he is "heartbroken" after it emerged that a spectator struck in the eye by one of his tee shots during last week's Ryder Cup could suffer long-term consequences. 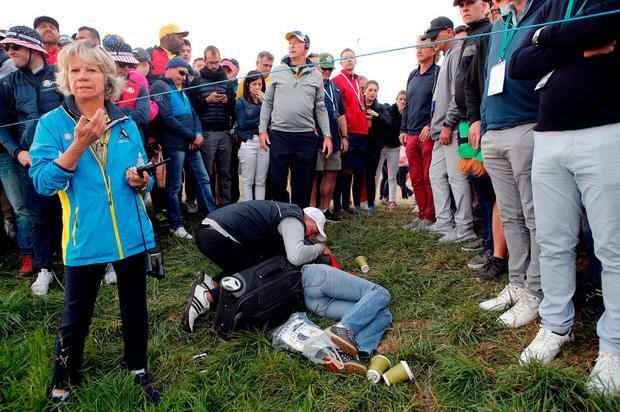 Corine Remande was hit by a wayward shot on the par-four sixth hole at Le Golf National in Paris and there have been reports she could lose the sight in her right eye. Koepka said in a statement on Twitter that he was "deeply hurt and saddened" by what he described as a "tragic accident". He said: "I spoke to her at the time on the golf course and after now learning her condition is worse than first thought, I have made contact with her/family to offer my sincere and heartfelt sympathy. "I am heartbroken by the incident. My thoughts remain with Ms Remande and her family, and I have asked to be kept informed of her condition." The 49-year-old Frenchwoman was treated on the course and in a nearby hospital before being transferred to Lyon. The European Tour has said it will offer "support for as long as necessary" to Ms Remande. In a statement released to Press Association Sport, a Ryder Cup spokesperson said: "It is distressing to hear that someone might suffer long-term consequences from a ball strike. "The spectator hit by a ball at the sixth hole during Friday's play was treated by first responders immediately and taken to hospital. "We have been in communication with the family involved, starting with the immediate on-course treatment and thereafter to provide support, helping with the logistics of repatriation, including providing a transfer for the family from Paris to Lyon. We will continue to offer support for as long as necessary. "Ball strikes are an occasional hazard for spectators but this kind of incident is extremely rare. We can confirm that 'fore' was shouted several times but also appreciate how hard it can be to know when and where every ball is struck if you are in the crowd. "We are hugely sympathetic and will do everything we can to support the spectator, insofar as that is possible under very difficult circumstances." Europe captain Thomas Bjorn said it was a "freak accident". He told Press Association Sport: "For me, the whole team I represent and everybody at Ryder Cup Europe, it's just a terrible thing and something that you don't want to happen. "It's terrible, it's a freak accident that's happened, and all our thoughts are with her." Koepka, the reigning US Open and US PGA champion, went on to win his match with Tony Finau, beating Justin Rose and Jon Rahm, but was still upset about the incident afterwards. He said at the time: "It doesn't feel good, it really doesn't. You feel terrible for them. You know exactly how they are feeling, especially when you've got to go over there and apologise, because they are in pain, usually bleeding, and then to hit her in the face - you don't want to hit anybody in the face, especially not a woman, and it's not a good feeling." The tee on the sixth hole had been moved forward to allow players to attempt to drive the green, but Koepka's shot was pulled left into the crowd. On television footage Koepka and other players can be heard shouting the traditional warning of "fore", but he added: "You can yell fore, but it doesn't matter. "If you're 150 yards, you're shouting fore, you can hear it. But from 300 yards, even if none of us said fore, she's going to get hit, and that's the unfortunate thing." PA Sport The Ryder Cup could return to England for the first time in 24 years with The Belfry under consideration to host the biennial contest again.